Talent and skills development is embedded in Frequency’s ethos. During each festival we create paid internship opportunities for recent graduates to engage directly with industry in order to develop their skills and employability. This benefits both employers and interns by increasing workforce capacity and developing emerging talent and skills in the creative industries. RADAR is a creative graduate accelerator scheme devised by Threshold Studios in collaboration with the University of Lincoln, offering paid internship placements and mentorship for creative graduates looking for a head start after University. Past participants in the RADAR scheme have gone onto a range of exciting careers such as creative advertising, web development, participatory arts, graphic design, as well as post-graduate study. 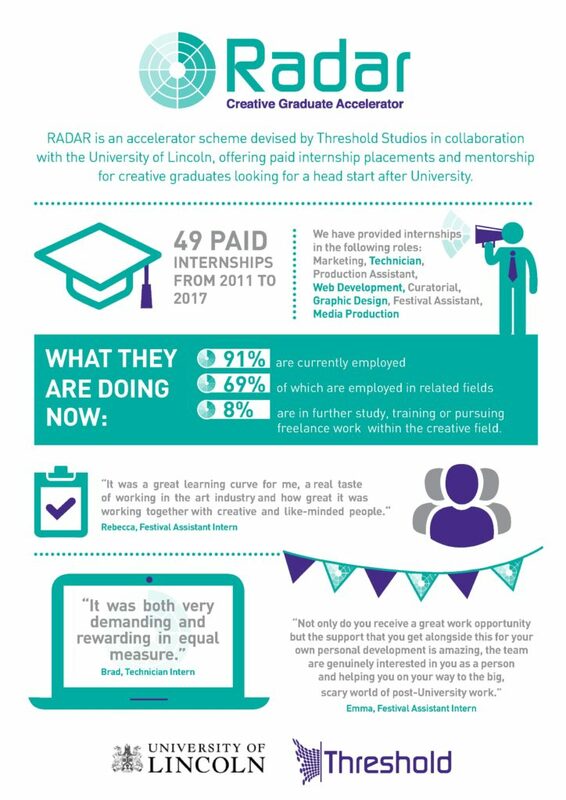 RADAR Creative Graduate Accelerator Scheme is open to University of Lincoln College of Arts graduates from within the last three years. Sign up to our newsletter to be the first to hear about internship opportunities or email info@frequency.org.uk to register your interest. We are now looking to open dialogue with educational institutions about schemes to boost employability and encourage graduate retention by connecting graduates with opportunities with SMEs in the creative and cultural sectors.